Taking home a new pet rat is an exciting event - it can be hard to fight the urge to pick up your new friend and love them right away. However, keep in mind that new pets need time to settle in before warming up to their new owners; your rats need time to get to know you and bond. Consider the following advice when gaining your new rat’s trust, and have plenty of patience! When you first bring your rat home, don’t immediately start trying to bond with it. The move from the pet store or breeder to your home has likely left your new friend nervous and stressed. It is best to simply place your rat in its new home (be it a cage or tank) and let him settle in. Make sure your rat has a full bottle of water, some food and some chew toys to relieve stress with. A nest is also a must, whether it is a store-bought hideaway or a simple box full of soft bedding or material. Don’t force your new friend out of its cage - remember to be patient and understanding. Note: If you are introducing a new rat to another rat you already own, do not place them in the same space right away. They need time to bond, too. After a couple of days of relaxation, you can begin bonding with your new pet rat. To do this properly, you must let your rat come to you; grabbing your rat forcefully will not help build trust. When you first try to reach out to your new friend, expect your rat to be cautious and unsure - this is normal. Introduce yourself to your rat in a slow, step-by-step process: luring your rat further and further toward the door of the cage and out to your hand is the best way to go. 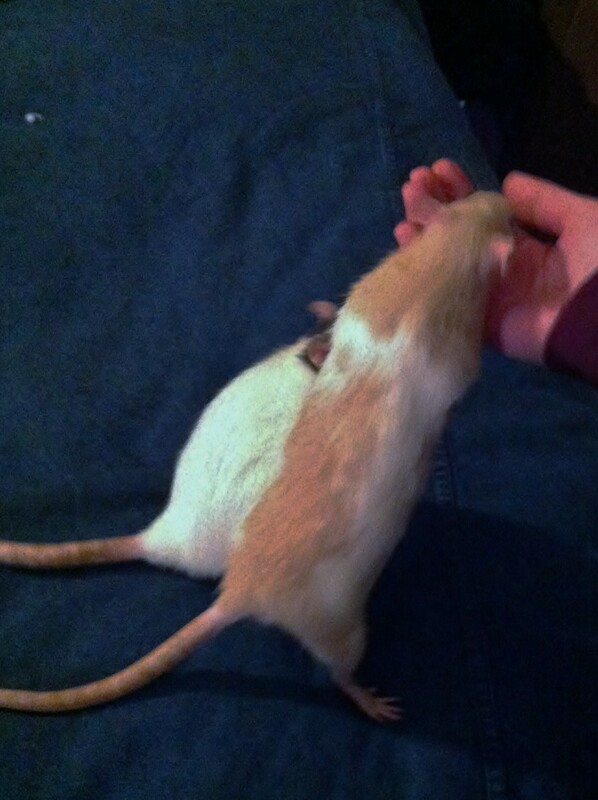 Treats are helpful when trying to coax your new rat out of hiding and onto your hand. 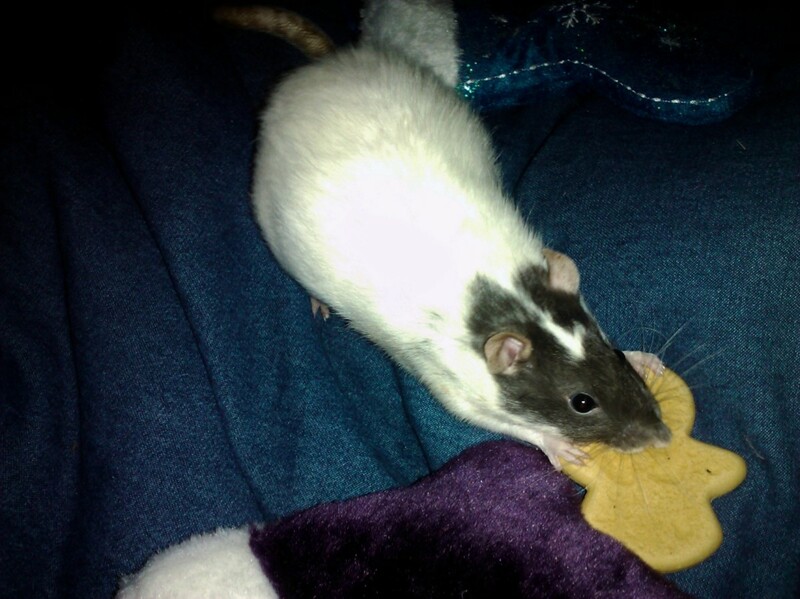 Munching on treats is a positive experience for rats - associating this experience with you helps the bonding experience. You can use store bought small animal treats, such as dried fruits and nuts, or rat-safe human treats. If your rat is especially nervous, try offering some yogurt or unsweetened applesauce on a spoon; these are treats your rat cannot run away and hide with. 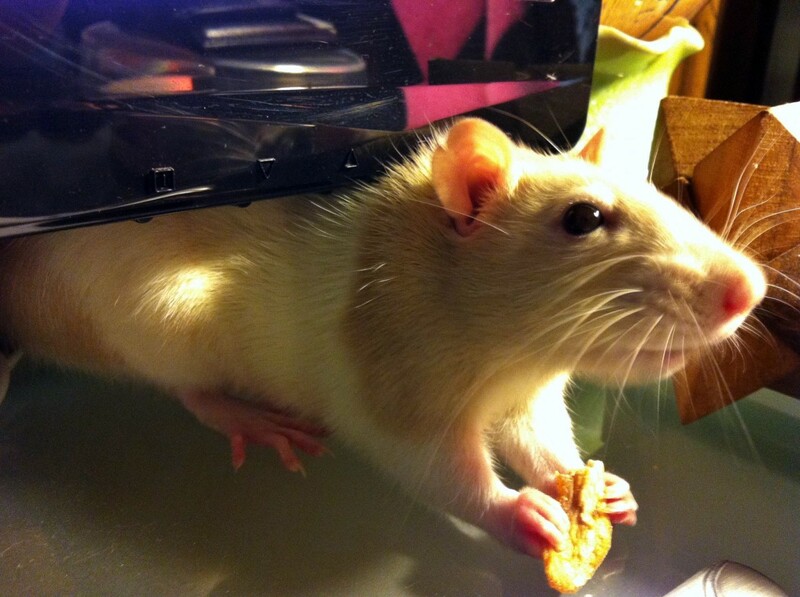 Over time, you can lead your rat further out of its home with treats and build up trust. Once you’ve gotten your new pet rat to leave its hideaway, you’ll both be curious about each other. Place your hand where your rat can reach and simply let it smell you. Rats learn a lot about their environment through their sense of smell and taste; over time, your rat will recognize your scent as friendly and familiar. Be sure to keep your hand still while your rat sniffs you out - sudden movements make your furry friend nervous. Because rats use their teeth to determine the contents of their environment, your rat may nibble at your fingers or knuckles. 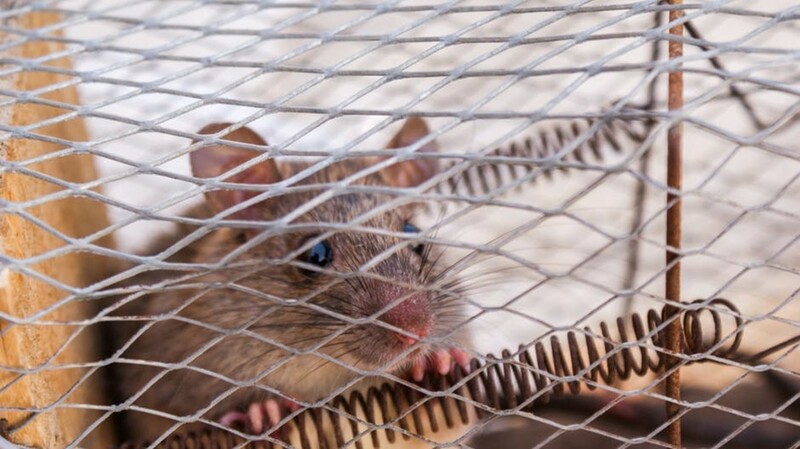 If your pet rat nibbles (or bites) you, don’t be discouraged: making a loud “eep” noise will discourage this behavior - it’s how rats tell each other they don’t like what is going on! If your rat has started to feel comfortable around your hands and fingers, try petting them! Rats are social animals and enjoy physical contact. 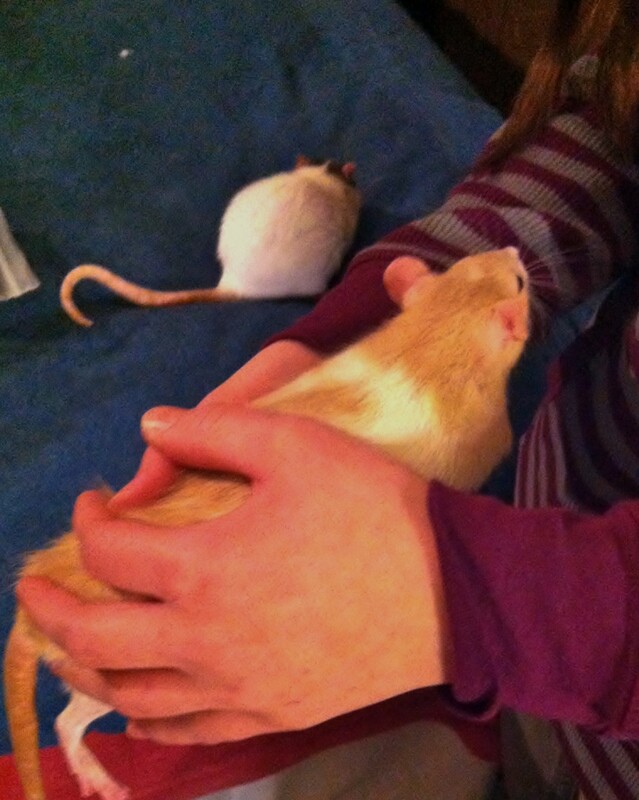 Petting your rat reinforces bonding time and makes them more trusting of your hands. 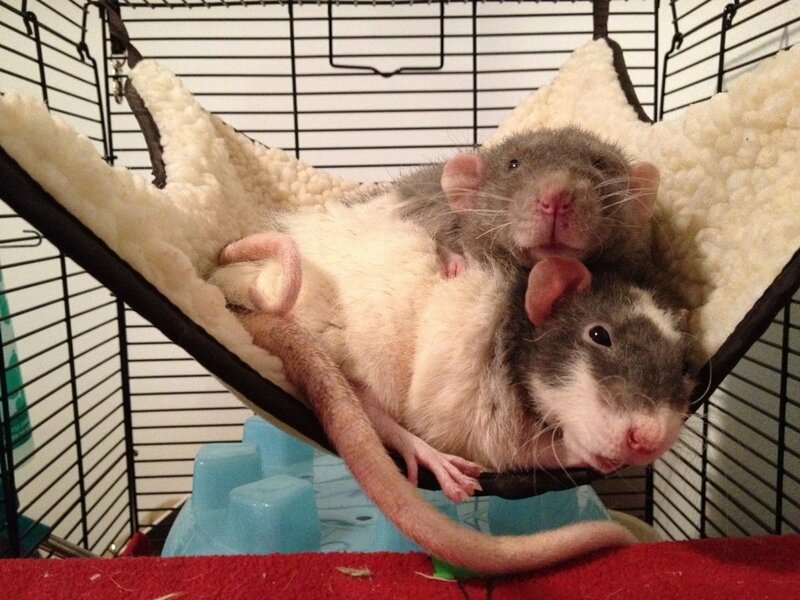 Most rats especially love being pet around their head and behind their ears - it’s like a little rat massage! Be slow and gentle when petting your rat for the first time: you want your new pet to know that you won’t hurt or scare them. How many rats do you own? In the beginning, no rat enjoys being picked up by their owner. Imagine being swept up into the air by a creature several times your size and held several feet above the ground! 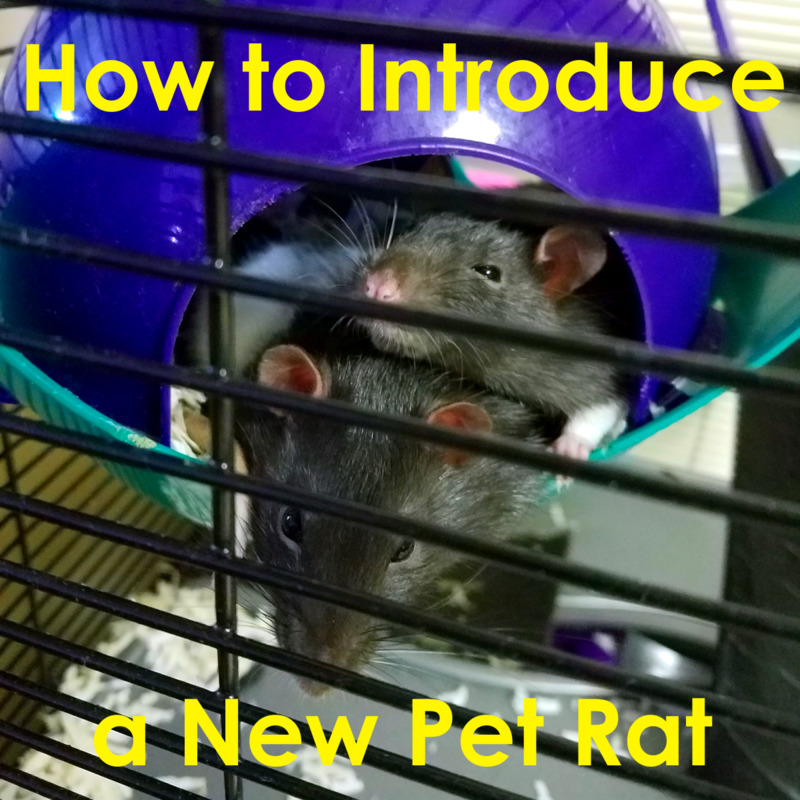 Scooping up and holding your pet rat is more than grabbing them by their middle and lifting them out of their cage; follow the tips below to make the process easy and painless. A tired rat is far less energetic and squirmy than a rat that’s been awake for an hour; when you plan on picking up your pet rat for the first time, try to do it when they are exhausted. Rats are nocturnal by nature and tend to sleep for hours during the day. If you approach your rat during their sleep schedule or just as they are waking up, they will be less skittish and much easier for you to handle. As emphasized above, sudden movements will frighten your pet rat and make them reluctant to approach you for a while. Once your rat is comfortable around you and your hands, you can slowly begin to pick up your rat! Try easing your fingers under your rat’s belly while petting it: rat’s don’t always like being pet on their stomachs, but the optimal way to pick up your rat involves scooping your rat up this way. Never pick your rat up by the tail! "Many small mammals are able to induce degloving of their tails to escape capture; this is comparable to tail autotomy in reptiles." You’ll have the most stability when picking up your rat by scooping one hand under its belly; lifting your rat from this central point will help maintain balance and give you a better grip on your rat. Since your pet rat is likely to be squirmy, you want to be sure not to let it jump out of your hand and fall to the floor. When you scoop your rat up from under its belly, try to let it rest its tail along your arm or on your hands. Your rat’s long tail helps with balance and is likely to swing around in the air. More importantly, never pick your rat up by its tail! 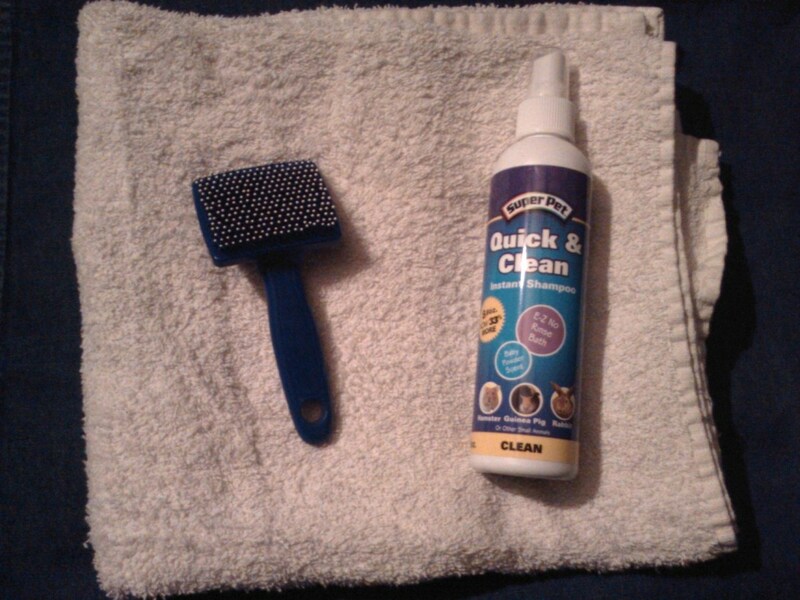 You can damage it this way, and your rat’s body regulates heat through the tail - its safety is essential. After you’ve picked your rat up from beneath its belly, use your other hand to cup above it for added security. Rats are quick, especially when they are little babies, and can jump out of an open hand and possibly injure themselves. Using two hands will also make your furry friend feel more safe in your grasp. The more you pick up your rat this way, the more comfortable they will become with you! So your rat finally lets you pick it up without a fuss? To improve your relationship, let it crawl around on your arms and perch on your shoulders. Pet rats enjoy hanging around with their owners and your shoulders provide the perfect place for them to sit while you walk or lounge around. 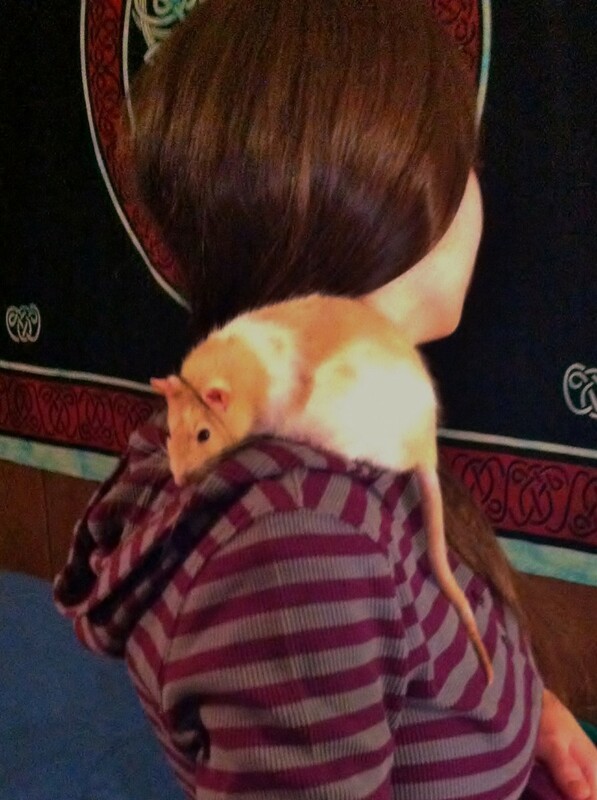 If you are wearing a sweatshirt, try letting your rat sit in your hood! They will feel secure there, and have plenty of room to relax. Who knows, your furry friend may even fall asleep on you! I had very little info about rats when I got him, and my friend (who had rats before me) didn't help and she was really mean to my rat. Now he hates any physical contact that I attempt to make (he bites and draws blood) but has a positive reaction when I talk to him. How can I fix my relationship with my pet rat? You can slowly try to warm him up to human contact again with treats. Something really enticing, like rat-safe people food. Do it like you are trying to lure a new rat out of its cage - open the door and offer the treats. Don't try to grab him out of the cage. You can even feed treats like baby food or tuna from a spoon - it will be irresistible and put some distance between you. You can then try to move on to feeding from your hand if he begins to trust you more, and eventually lead up to physical contact. I'm sorry that your friend treated your rat this way, and hope he will warm up to you over time. How do I train my pet rat to ring a desk bell? That sounds like a fun trick! You could lure him over to the bell with a treat and get him to step on it before rewarding him. I'm sure if he does it enough, he'll learn that the bell equals food! @Emma Are you letting Lucy come out of the cage to smell you, or is she always in that corner? When I got my two boys earlier this year, he was always hiding in the top corner of the cage. Try putting a yummy treat on a spoon, something like plain yogurt or baby food, that she can't pick up and run away with. Over time you may be able to lure her further away from her corner, and help build trust between you! I got two female feeder rats a couple days ago, and I’ve been letting them smell and nibble my hand everyday, but one of them (her name is Lucy) seems very shy and nervous. She’s always cooped up in their corner in the cage, and when I’d put my hand where she was to smell me, she bites my finger very hard and it bleeds. This is my first time having rats, and after Lucy biting me, I got too scared to let them smell my hand. What can I do for both Lucy and me to have more trust? We have 3 boys. We've had them about three months now. They are so sweet and so much fun. My daughter and I just love those little guys. We let them out in her bedroom and sit on the floor with them. They crawl all over us and give little love nips. Best little pets in the world. @Kirsty It sounds like they just need time to get to know you! I'd let them settle in for a few days, but you can try luring them out slowly with tasty treats. 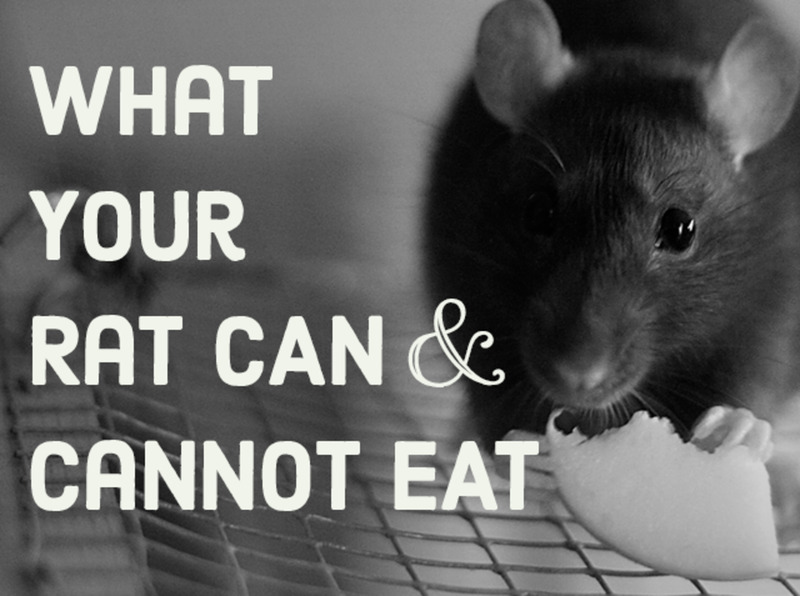 You can use store-bought rat-safe treats, or rat-safe human food if they need more incentive. Mine have always loved blueberries! There's a list floating around of rat-safe foods that will help you decide if something is okay to feed them. Once you can lure them out of their hiding spots and at the cage doors, you can work on getting them to smell and walk on to your hands! Hi. 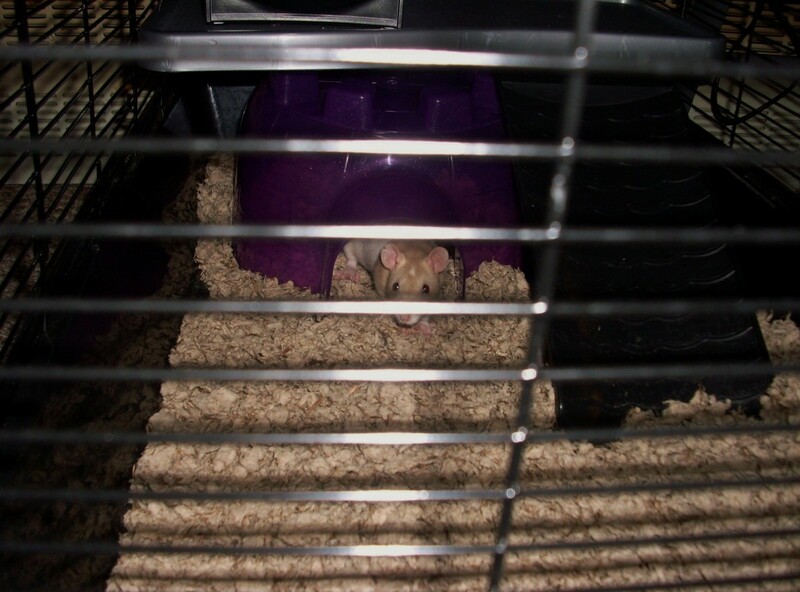 We bought 2 pet rats yesterday (both female). We were told to start handling them today but we can’t get them out their 3 level cage. From what I’ve read here it seems that we should give them more time to settle in and adjust. Any tips on handling them would be greatly appreciated please. @Ashton Welch It makes me so happy when others realize how loving rats are! Enjoy your new furbabies. I've paid around $10 for one rat at the store in the past. My current rat cage (All Living Things Rat Starter Kit) is $100. The kit comes with the water bottle, dish, wheel, a sample of food, and a sample of bedding. I personally feed Oxbow brand food though - it's healthier than the seed blend included in the kit. You can find it online and in some stores - I last bought the Young Mouse and Rat formula for about $13. I'd also buy a bag of paper bedding when getting everything set up, since the sample included won't get you very far. I just use store brand, about $15 for a bigger bag. They also need sticks to chew - I got a bundle of long willow sticks for $3 or $4. If you got all of those things in your shopping trip, it would cost about $142. Other accessories to consider are a hideaway for them to nest in, and hammocks to hang from the ceiling of the cage. 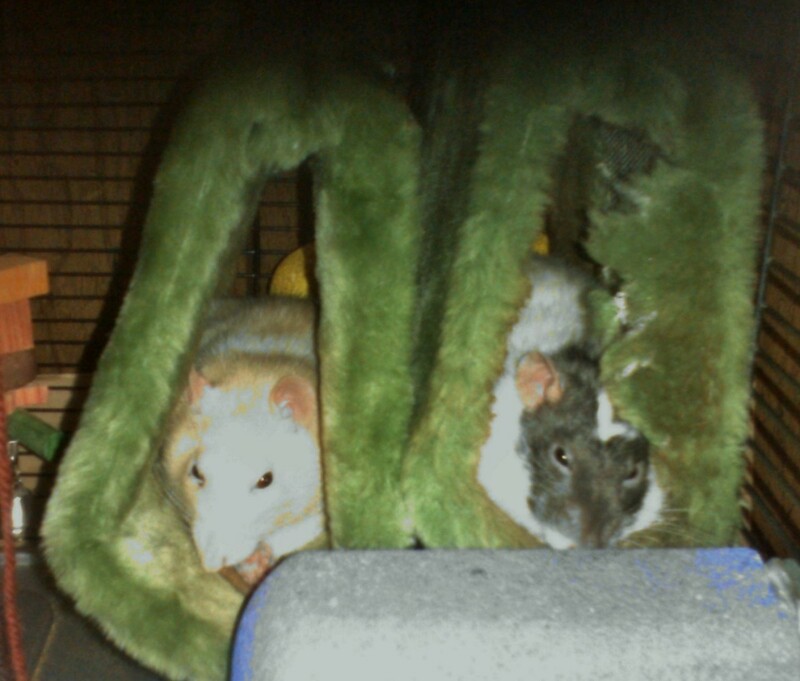 I'd personally recommend the plastic Critter Space Pod - my rats have always destroyed fabric hammocks, and the plastic is a lot easier to clean. I'd also recommend paying the extra money to get another rat - they do a lot better in pairs and really thrive with companionship. And don't forget treats! About how much money does it take to get one rat with everything? I want one so bad! And I think I have enough. I just wanted to hear it from someone who has a rat. @Ava I hope you get some! They are such great pets. I have 2 pet store boys. I've had them about 2 months. I've done all that you've suggested since the time I've gotten them and they're still super skittish. We've gotten to the point where I can pick them up for a couple of seconds, then they jump down. One actually got so freaked he jumped off of me and hid under the couch. Wouldn't even come out for food. Now I'm scared to take them out of their cage at all. I'm just wondering if I'm doing something wrong or other suggestions. They love to climb on my arms and to my shoulder, but bolt if I move. They will climb on my hands and lick my hands but if I try to pet them they squirm away. They loving giving me kisses, even on my face. I'd love to let them chill with me on the couch, but they just aren't trusting enough yet. @Sylvia He may just need time to bond and adjust. If he was attacked and beat up a lot before he came to you, he may just be wary of trusting others. Is he doing all right with your other rat? I started caring for my sons rat when he had to leave for a while and I fell in love!! Now he's with me permanatley. He's so wonderful he has great body language telling me what he wants from me and he loves to hang out with me..and absolutely loves to eat anything I give him!! My problem is I wanted him to have a friend so I went to the pet store and got one that was pretty beat up looking missing part of his tail etc. I felt sorry for him and wanted to save him he's been getting better but he's bitten both my sons and I'm nervous to handle him... I know he's interested in me and I let him smell my hand but he's very shy (they are both feeders) why is one so secure and the other so frightful and timid? @Mat I'm glad it helped you! Thank you for telling me this stuff it was very helpful. @Ruby Kelly You rescued a rat? That's so sweet of you! Poor thing. I hope your interactions continue to go well. @Marley Gronfors Congratulations! I've never had male rats, but from what I understand they are more relaxed than females (and thus make better cuddle buddies). And I think albino ratties are really cute - they deserve more love than a lot of people give them. Enjoy your new rat babies! @Payton's rat cake - If she seems healthy otherwise I think it's okay? Are you playing with her a lot before she gets tired? If she seems lethargic after being in her cage all day, she could be feeling lonely. I have a rat named cake and she's a good rat she gets tired so fast is that good or bad?? Maybe it's because she's the only one and she doesn't have another rat friend but we did have another her name was Rita but soon we'll get her a friend. this website is really helpful i never knew that it takes time for rats and owners to bond but me and sister are getting our baby rats next week from my sister's friend who has rats were getting 2 adorable little boys mine's a albino rat with pink eyes. their names are thor and loki the pictures are really great too can't wait to start bonding with my little friend. @Morgan That makes me so happy! I am glad that they are warming up to you. You gave them adorable names! Enjoy them, ratties are the best small pets. Thank you so much! When my rats are awake they are begging for attention. It's great for them to have bonding time, especially if you only have one. Thanks again! 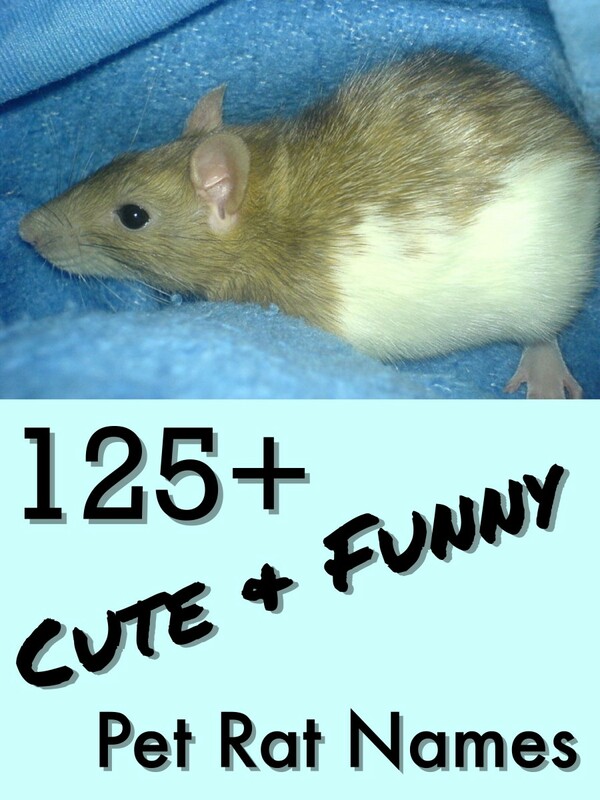 I've never thought about buying a pet rat, but your Hub makes them sound like awesome pets, and their acutally pretty cute. I really love your suggestion of letting the rat hang out with you around the house. I've always wanted a pet rat, but with two cats in the house I don't think it would be a good idea. Good articles, give me a bit more insight into how to handle a rat if I were to ever get one. Voted up. My favorite pet rat was also black and white. He was incredibly smart, though did not get along with other rats. Just with humans! Thanks for reading! They are really clever. 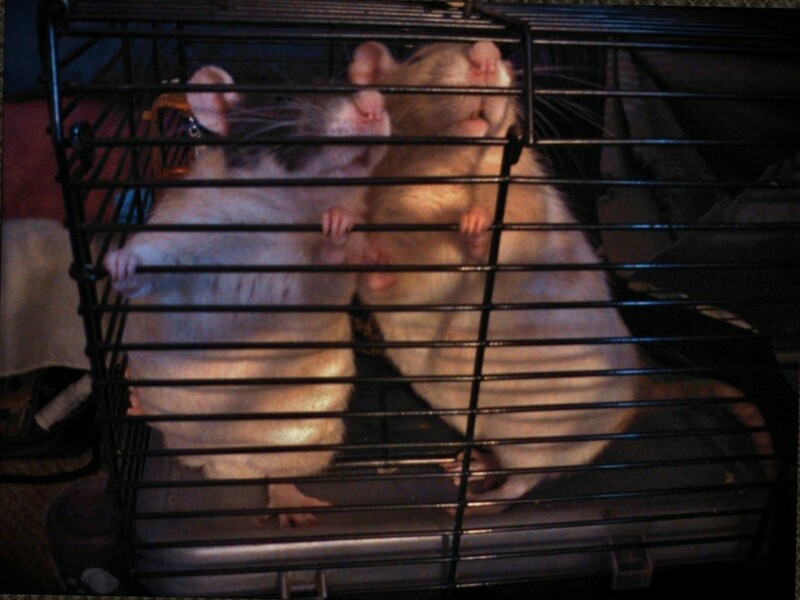 My second rat (the black and white one) will climb onto my hand and grab my wrist when she wants to be picked up. She's a funny one. Fun hub! I used to have pet rats as a kid. One was especially smart and learned to do a bunch of tricks. Loved the great pics, too! Thanks for the feedback! These are my first two rats and I absolutely adore them. The only downside was losing a few pillowcases and a blanket because they are active chewers. I'm glad you liked the pictures! My kids all had pet rats growing up - they can be great pets if they are well taken care of. Great information and I enjoyed the pictures!